This post we take a look at 3 Websites for Royalty Free Cinematic Music. Perfect if you’re looking for some epic cinematic music to spice up your trailer, or just giving that short film you’re working on an exciting climax. Video Copilot’s Pro Scores package is most probably one of the best packages of cinematic music available on the web today. Orchestral Music Tracks and Epic Musical Elements. Tension Building Elements & Editorial Music FX. 5 In-Depth Tutorials + 5 Layered Soundtrack Templates. Pro Scores offers 5 different music styles including Inspirational, Massive, Percussion, Suspense, and Action. Pro Scores also includes hundreds of music design elements like atmospheres, drums, etc. Along with the package comes 85 minutes of training, teaching you how to customize and build amazing sound tracks. Pro Scores doesn’t just give you premade scores, it also offers assets to build your own cinematic music. Audio Jungle’s royalty free music has a large and great variety of music – not just cinematic, too. User submitted music, sold singularly or in packs. Great high quality music with fresh content submitted daily. Potentially expensive for the average video hobbyist, but you pay for what you get. Links with other Envato marketplaces such as Video Hive, Theme Forest, and Graphic River. Audio Jungle has a wide range of high quality user-submitted music. The site is very easy to browse and use. 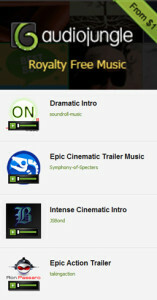 You’re able to easily find music whether you’re looking for just cinematic music, or cinematic music packs. It allows you to preview every score, which is great if you’re wanting to download and test it in your project before you purchase it. Audio Jungle is great for anyone looking for royalty free music. 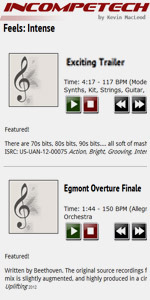 Incompetech’s royalty free music is free, high quality, and easy to search through music. Search by genre, keywords, or feel. Easily browse through music, search by ‘feel’. E.g. Action, relaxed, humorous, etc. Free download – through attribution is required. Easy to download. There’s no registration required, pop-ups, or surveys. Easy to preview, and navigate between scores. Website is responsive and fast. Incompetech has a wide range of royalty free music. It’s a great resource if you’re not wanting to pay for tracks individually or in packages, for uses like low-cost shorts. It has a great range of cinematic music, there are loads of other genres and ‘feels’ to explore. All that’s required to use the music is simple attribution. I haven’t heard of Video Copilot, so thank you for that! I would also Check out http://www.smartsound.com/royalty-free-music/. They have a program that allows you to customize tracks down to the instrument. They also tell you exactly which licence you are paying for, so you don’t have the hassle of figuring out what royalties you get. Here’s their section for cinematic royalty free music. Thanks again for posting this!